This unfinished 4L Shaker glazed Roomfold Deluxe internal bifolding door system with frosted glass allows light to pass through whilst maintaining privacy between rooms. To decide on the best solution of which internal bifold doors are for you, take time to review the opening sizes and product sizes available before selecting the option to buy. 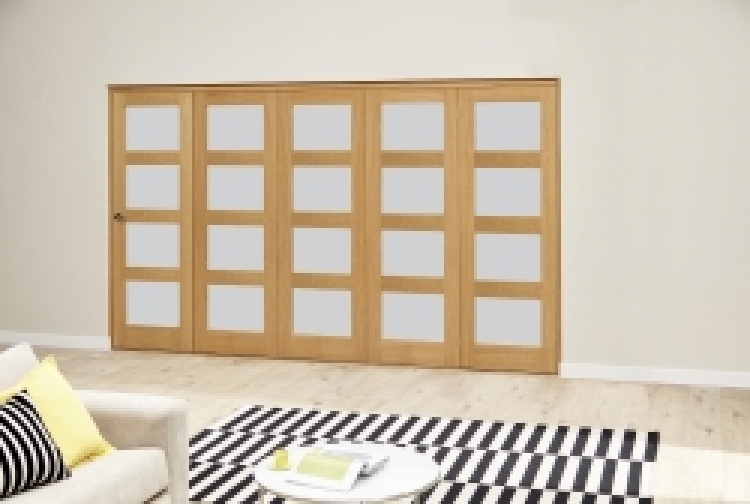 Please refer to our storage and decorating recomendations before installing the doors. All doors MUST be decorated before installation. All our systems are offered without handles to allow you to match existing ironmongery in your room. Vibrant Doors offers technical advice and support on any interior folding doors, so if you have a size which is near to one of our standard sizes, dont hesitate to call and we'll give you our help.